Both the teams are packed with match-winning all-rounder square off in the grand finale. While it might just sound clichéd, it wouldn’t entirely be an exaggeration to suggest that two of the most spirited sides in the tournament have made the finals. 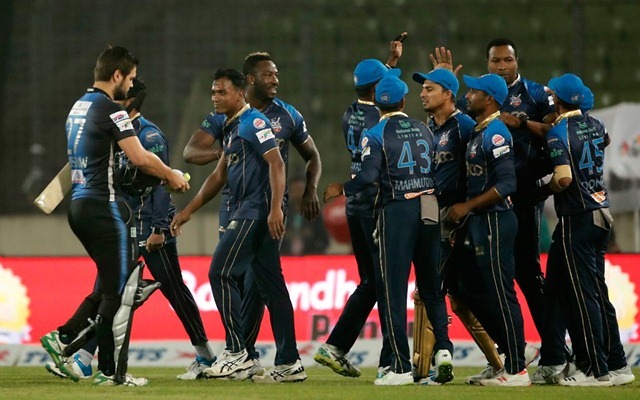 Dhaka Dynamites have had a remarkable past few days. Not only did they beat Khulna Titans to make the qualification cut, they got past the Chittagong Vikings in the Eliminator and then nudged out Rangpur Riders in Qualifier 2. Suddenly, they now find themselves in the final and they’ve got all the momentum in the world. Comilla on the other hand, hammered the table-toppers Rangpur Riders by 8 wickets to book their slot in the final. 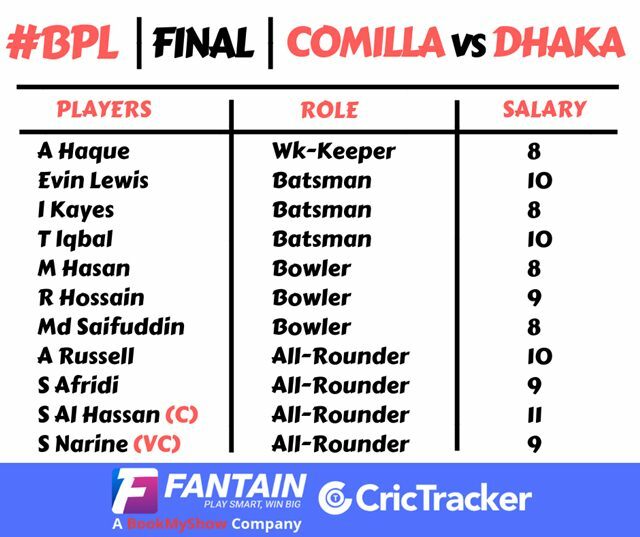 Comilla has displayed strong form in the tournament with eight-wins leading up to the knock-out stages and they’ll look to count on their strong beginning to get them past the brave Dhaka outfit in the final. Sunil Narine wielded his blade with authority and the Dynamites have blown the opposition to smithereens just when it mattered. In the big final, Dhaka will look up to Narine for one final push. Also, his colleagues from the Caribbean – Kieron Pollard and Andre Russell – will look to use all their experience to ensure Dhaka lifts this one. Tharanga, Narine, Rony, Shakib (C), Pollard, Nurul (WK), Russell, Hom, Rubel, Mahmudul and Onik. Mohammed Saifuddin, Tamim Iqbal and ImrulKayes have shone like a beacon for Comilla. That said, they certainly could do with greater contributions from some of the other local lads. Comilla would once again count on their Caribbean import Evin Lewis. The stroke-maker has a tendency of scoring big tons and Comilla will be hoping that the final is one such night when Lewis turns up the heat. Lewis, Tamim, Anamul (WK), Shamsur, Kayes (C), Afridi, Perera, Saifuddin, Mahedi, Wahab and Sanjit. Mohammad Saifuddin has been fantastic in the lead up to the final and you could pick him for a strong bowler. Also, MahediHasan’s off-spinners could pick up a wicket or two as well.